Predict results can be displayed in other Insight views by adding the results (as curves) to the well. This can be enabled and configured in the Wells tab of the Predict window. Once added, they behave similarly to other well curves in Insight. The output curves can also be exported as .su format files to a destination folder (see Formats accepted by Insight for import and export). From the Predict window, click on the Wells tab. Under the Add Well Curves to Well section, select the Add output curves check box to add the output curves to the wells. Enter a Curve Prefix to be displayed in the list of well curves. The output curves can be chosen in the Details Panel of the Well tab in Insight's Control Panel. See the following example. Predict will construct relative impedance and low frequency curves based on the Filter settings. Raw log curves have a high-cut filter applied at the Top End Freq to remove high frequencies (noise and values above the Nyquist frequency). Curves have a low-pass filter applied at the Notch frequency to generate the low-frequency well results. Curves have a low-cut filter applied at the Notch frequency to generate the relative-impedance well results. 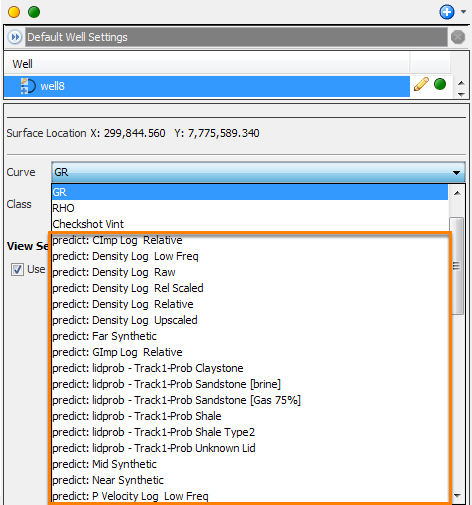 At the Export Well Curves section, select whether to export for All Wells or only the Current Well. Enter the sample interval in milliseconds for exported low-frequency traces at LF dt (ms). Browse to a destination to save all the output curves, type a File Name for the new folder, and click Save. All the output curves will be exported into the destination folder as .su files.